“From Paris with Love” is part of the first annual JAZZ.FM91’s World Music Festival and features different world music every night. The festival takes place at Hugh’s Room and goes from Tuesday, August 6th to Saturday, August 10th. “From Paris with Love” is on Friday, August 9th. It features vocalists Amy McConnell & Lyne Tremblay singing the music of Piaf, Brel, Trenet, Legrand and many more. The band features Mark Kieswetter on piano, Jesse Barksdale on guitar, Drew Jurecka on violin, Fabrice Sicco on accordion, Ross MacIntyre on bass and Ernesto Cervini on drums. Friday, August 9th, 2013 at 8:30PM, JAZZ.FM91 presents an evening of French Jazz featuring Amy McConnell & Lyne Tremblay, with Mark Kieswetter on piano, Jesse Barskdale on guitar, Drew Jurecka on violin, Fabrice Sicco on accordion, Ross MacIntyre on bass and Ernesto Cervini on drums. We will be performing the songs of Michel Legrand, Edith Piaf, Jacques Brel, Django Reinhardt, Josephine Baker and more. This performance is part of the first annual JAZZ.FM91 World Music Festival – with 5 concerts running from Tuesday, August 6, 2013 to Saturday, August 10, 2013 at Hugh’s Room. The festival showcases jazz fusion from around the world featuring an eclectic mix of international and local jazz artists. On TUES, APR 30 @ 7PM. 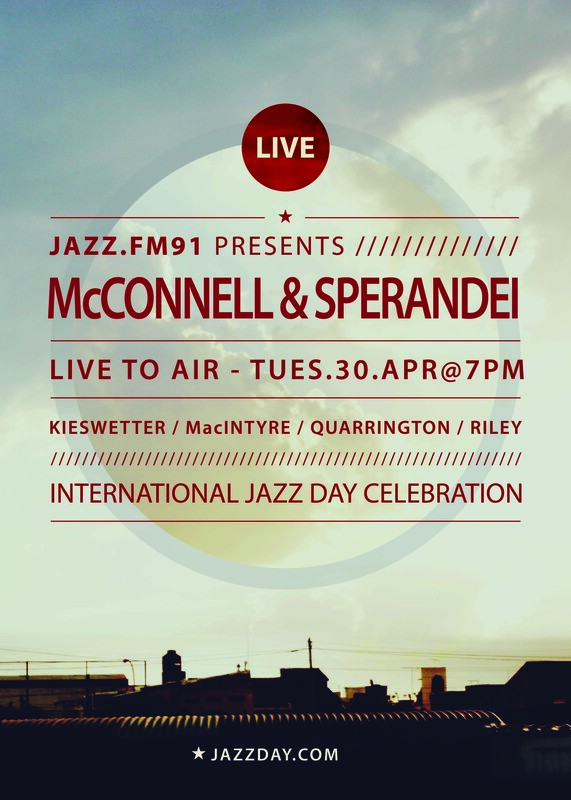 JAZZ.FM91 will hold an evening Open House and welcome in our listeners and locals musicians for a night of music. At 7:00 pm in our Performance Hall we’ll invite Amy McConnell and William Sperandei’s Quintet to perform Live to Air and then at 8:00 local instrumental group Triodes. Tune in jazz.fm! Amy McConnell / William Sperandei Quintet perform songs from their brand new CD, “Stealing Genius” which is being played on JAZZ.FM91 and radio across the country. Vocalist Amy McConnell and trumpeter William Sperandei released their debut album “Stealing Genius” to a sold out room and eager crowd at The Gladstone Hotel a month ago. If you missed this show now is your chance to see these two talented individuals live at Hugh’s Room on December 30, 8PM. “Stealing Genius” is the brainchild of executive producer Feisal Patel who heard William Sperandei playing in a tiny Toronto club late one night and has been wanting to record with him ever since. William and Feisal both wanted to record with a singer and began the search for the right one. Five years later, at a local jazz jam, Feisal discovered Amy’s incredible voice and the result is “Stealing Genius”, a collection of covers of great songwriters. While the songs are all familiar, several are rarely covered. Amy & William chose with care. They wanted beautiful melodies and poignant lyrics and did not limit themselves to standards. Their repertoire moves from ‘40s pop to ‘50s R&B to ‘60s musicals. Covering Elvis, Edith Piaf and Led Zeppelin, the unifying thread is their distinctive sound and approach to the music. Don Francks is an actor/singer/jazz musician. He began his music career playing Toronto hotspots such as The Colonial Tavern and George’s Spaghetti House before moving to New York to record and perform with guitar legend Lenny Breau. He was “discovered” by Jackie Gleason whose quote became the title of his seminal sixties recording called “There Is No One On Earth Like Don Francks”. Although he has often played villains on shows such as Mission Impossible, The Wild Wild West, Man From U.N.C.L.E. and countless others, he is an affable, unthreatening man on stage while singing his unique style of jazz. Don will be joined by fellow actor-crooner Roger Clown, who has himself starred in countless films, television commercials and has sung for everyone from Pope John Paul II to the Queen Mum. Expect the unexpected for this show featuring Tony Quarrington, Great Bob Scottand other fearless musicians.